Which TV Show Left You With the Most Agonizing Cliffhanger? Today, we shared an interview with Liam “Ser Davos” Cunningham, who helped answer some of the questions that Game of Thrones left us with when it ended its fifth season. (Though not, of course, its biggest one.) But GoT isn’t the only science fiction, fantasy or horror show to bust out an insane cliffhanger. Not by a long shot. For me, the biggest one of all has gotta be Twin Peaks’ blistering “How’s Annie?” finale, and we may yet get some closure on that one with the show’s long-awaited return. (Please, please, please.) A more recent once? Hannibal’s breathtakingly gruesome season two capper, in which blood sprayed everywhere as nearly every major character sustained what looked to be fatal injuries. Which TV show left you screaming for answers and impatient for MORE! when it ended its season, or series run? Let’s commiserate! Please include a picture, clip, or other image for your chosen program. Thank you! 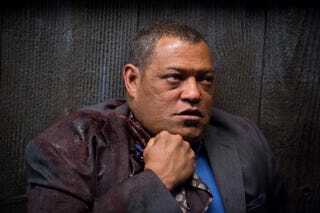 Top image of Jack Crawford (Laurence Fishburne) clinging to life on Hannibal’s season two finale, “Mizumono,” by Brooke Palmer/NBC.